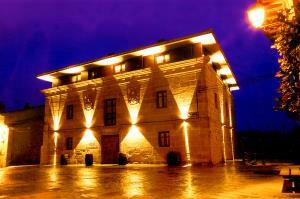 This hotel offers various wine tourism programmes throughout the year. Visit their web site to find further details. 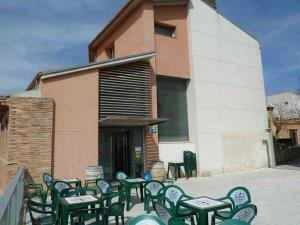 Hotel situated in the Bodegas Vinícola Real. Rooms with names taken from the Albelda Codex which was made in the 10th century in the Monastery of San Martín of Albelda. With very elaborate decor mixing basic country and modern styles, the bedrooms have colour TV with remote control, telephone, minibar, safe, piped music, and full bathroom. La Casona de Aldealobos is the final result of the renovation of an old hayloft built in 1890, the bottom part being used for livestock and the upper part for storing hay and the animal fodder. The most characteristic elements of the area have been preserved, the façade with its old stone from the River, the warmth of the wood, the masonry walls and the outdoor courtyard. The house is for renting whole, with a capacity for 10 persons, with two floors and a beautiful outdoor courtyard with porch and typical elements of the area. The courtyard has wrought iron garden furniture to sit outside in the good weather. The ground floor consists of a living-dining room, a double room and bathroom, all adapted for people with disabilities. Upstairs has 4 bedrooms,two with a double bed and two with double beds. Various cots and extra beds available, and two bathrooms. All decorated in a rustic style to fit the place. Visits to strong>wineries, some with walks through vineyards, winetasting and traditional meal. Routes fortrekking through Sierra La Hez an ideal area for hearing the deer bellowing and admire the beauty of its landscapes declared Biosphere Reserve and an area appropriate for nearby mushroom picking and hunting. 4X4 hire for off-road routes. Numerous Patron Saint festivities in towns and villages, Fiesta de la Molienda (Grinding festivity) in July with sample tasting. In August art exhibition at Santa Lucía de Ocón and the walk through Ocón villages, BTT trial, rally, mushroom pickings. Almost all the villages in the Valley have several recreational areas (equipped with tables, water drinking fountains, BBQs, some with swings and ping pong table, etc. As cultural heritage, we can highlight Church of Ntra. Sra de las Virtudes 17th century, the 16th century hermitagepre-Roman archaeological sites, the houses in the village with coats-of-arms, the castle, the flour mill -unique in La Rioja, ostrich farm, archaeological site of Parpalinas. 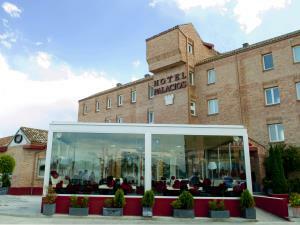 Excellent quality-price ratio, as well as its strategic location with excellent road connections, near Logroño, Pamplona, Zaragoza and Soria, Parque Temático Senda Viva and Parque Natural de las Bardenas Reales, all make this hotel the ideal accommodation whether for business trips or tourist getaways. In Alfaro we can find the Collegiate Church of San Miguel which has the largest urban colony of white stork nests in the world, with nearly a hundred nests, and the Reserva Natural de los Sotos de Alfaro, a privileged natural area for river habitat flora and wildlife. The hotel, with 72 rooms with full bathroom and a rear garden, has meeting rooms and a restaurant where guests can enjoy typical regional dishes. As always, Hotel Victoria, is at the service of the locals and visitors. We have now joined the multinational chain Accor to be stronger, to offer you the best services and promote the name of Arnedo (the shoe town) abroad. Our hotel is colourful, bright, having been recentlyrefurbished. But what makes us stand out from the rest is our personalised service as well as our wide range of services. 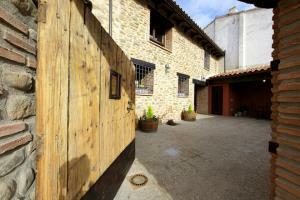 We want to offer you the ideal accommodation for you to enjoy your stay in Rioja. Do we know each other? Award certificate for accessibility and adaptability for persons with reduced mobility in the accessible category awarded by Equalitas Vitae. We are a family run business, we do not belong to any chain. That's why we work professionally, but also with great enthusiasm and much love. We love our job because we like people. We offer free WI-FI and continental breakfast. 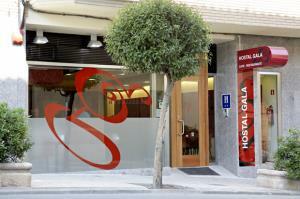 We are a member of La Rioja Gastrohotel Club, which relates accommodation with good food. Our a la carte restaurant and daily menu specialise in La Rioja cuisine. We have our own garden and offer seasonal produce. We have a bar-Cafeteria and common lounge with a fireplace. Espacio Platea is our Lounge Bar, an A/C terrace-gastrobar where you can dine and enjoy your first drinks of the Arnedo night. We organize all kinds of events in our fully equipped rooms. We personally manage your getaway. We believe that a quality service and close and friendly approach are essential. Come and see for yourself. Camping de Bañares has a flat terrain, abundant grass , trees and asphalted roads. Various leisure activities, swimming pool, kids pool, tennis court, fronton (pelota) court), horseriding, sports ground, other sports, adventure sports. Mobil homes, caravans or tents. Located in the Valley of San Millán in Sierra de la Demanda. Its tourist attractions are the Monasteries of San Millán ( Yuso and Suso), World Heritage Site. Cradle of the Castilian language. Trekking ( GR-93 trail). Landscapes of beech and yew trees. Height above sea level: 727 m. rental of Mobile homes and Bungalows. It has a WC fully adapted for the disabled. Restaurant offering typical Riojan cuisine: vine roasted lamb chops, patatas a la riojana...High season: 16 June to 15 September. The price of the pitch includes tent, caravan or motorhome, car and electricity. Superb 18th century mansion used as the headquarters by Italian troops and which today, magnificently restored, houses a small hotel with all the nobility and splendour of its glorious past. 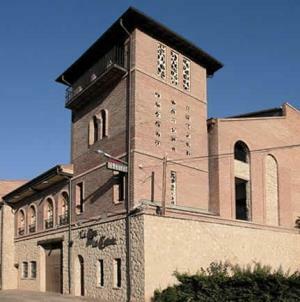 Los Calaos de Briones ofrece a los viajeros alojamiento en un edificio del siglo XVII, restaurado con el respeto que merece una población declarada Conjunto Histórico Artístico. 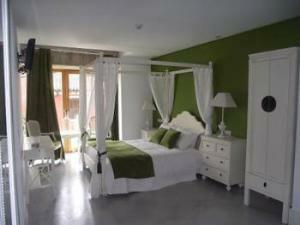 Precio: 9 euros pilgrim/day no sheets and 12 euros pilgrim/day with sheets. PAX: 18 beds in 9 double rooms. Category: Owner: Excmo. 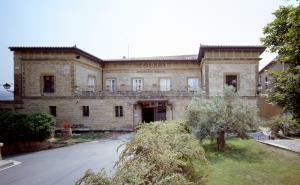 Ayuntamiento de Calahorra. Observations: Internal Rules for Pilgrim Hostels. New-build establishment, offering comfortable accommodation, especially forprofessional clients during the week seeking comfort along with all amenities, such as, for example, all rooms with full bathroom, flat TV of 20", TV channels: state, regional and satellite, free Internet connection in all rooms and Lounge, terminal for our guests' use. Exclusive parking at the establishment for all guests, Cafeteria and restaurant for guests and the public in general. At weekends many residents from neighbouring communities, as well as from other more distant ones, stay with us to enjoy the gastronomy of our land as well as the hospitality of its inhabitants.Open every day of the year, dining room for the guests and the general public. Free Internet in all rooms, flat TV, designer bathroom, interior parking for our guests, buffet breakfast.